1. Best Incentive Program: Best use of a corporate-funded prepaid card/program that delivers incentives, rewards, rebates, discounts or cashback deals to employees, affiliates or consumers. 3. Best Benefits Delivery: Best use of a government-, business- or corporate-funded prepaid card to deliver employee or government benefits/refunds or disaster relief/ humanitarian aid (excludes health care). 5. Consumer Champion: The card or program that delivers the best consumer value proposition for features, functionality, service and price. 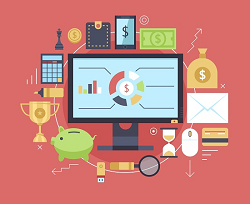 Judged based on CFSI’s Compass Principles, aspirational guidelines for the financial services industry, offering standards of excellence for designing and delivering basic tools people use to manage their daily financial lives and improve their financial health. 6. Best Design: Most impactful design of a prepaid form factor, such as a card, fob, etc., and/or packaging. 7. Best B2B Problem Solver: Best use of a business- or corporate-funded prepaid card in a B2B application, such as T&E cards, payouts and other check replacements. 8. Startup of the Year: The organization that’s new to prepaid and offering the program, technology, product or service with the potential to move the industry forward. 9. Product of the Year: The product launched in 2016 that pushed the boundaries of prepaid innovation by creating an out-of-the-box or elegant solution to penetrate new geographies, address new markets or otherwise expand the industry. 10. Gift Card Innovation: New or innovative approach to gift cards (technology, marketing, value-add) that helps retailers increase sales and/or loyalty. 11. Outstanding Loyalty Program: Loyalty or rewards program that delivers results for a retailer or marketer by providing rich, easyto-use benefits to customers. 12. Best M-POS Solution: Best use of a mobile POS to provide flexibility to retailers/ small businesses for accepting payments, along with value-added services. 13. Best Online or Mobile Checkout: Most effective solution at driving online/mobile checkout conversions. Simple, secure and easy for merchants/consumers to adopt. 14. Best Marketing Campaign: Most effective and enticing consumer marketing campaign—which may include media advertising, social media, events, direct sales and/or Web sales—to generate awareness, education or sales for prepaid, digital payments products or loyalty program. NEW! 15. Outstanding Commerce Innovation: Best new technology or solution for helping retailers embrace omnichannel commerce and drive customer engagement/ visits/sales. 17. M-Wallet of the Year: The in-market mobile wallet that provides end users with value-added features and/or enhances payment capabilities, user decision-making or loyalty. 18. Best Blockchain Pilot: Most promising test of implementing blockchain technology to solve a payments problem. 19. Most Innovative Technology: The payments technology that pushes the boundaries of the industry, solves a problem and/or enables electronic payments to become more accessible/usable for value chain participants or end users. 20. The Fraud Fighter: The organization, platform or technology offering the most effective solution for payment fraud detection and prevention. 21. Outstanding White-Label Platform: The white-label platform that creates outstanding opportunities to share solutions, benefiting developers/clients by expanding their market and users by avoiding redundant R&D and other costs. 22. Startup of the Year: The young company that’s burst onto the scene with the potential to disrupt or advance the payments industry in a significant way. 23. Change Agent of the Year: The payments technology company that contributed most to the advancement or evolution of the industry in the past 12 months. 24. Industry Achievement: The individual who made the most significant contribution to the success of prepaid or emerging payments this year or throughout his or her career. Download the full nomination brochure. See tips to win and read about past winners. Cachet Financial Solutions is working with Central Bank of Kansas City again. The two companies, which in March announced a partnership to bring mobile-optimized prepaid programs to community banks, now are working with Rebar Interactive to provide Select Mobile Money-Express, a platform that includes a Mastercard-branded prepaid card. Mercator: Consumer Prepaid Sales Drop in U.S.
U.S. consumers aren’t buying as many prepaid cards, according to a new consumer survey from Mercator Advisory Group. The data show 56 percent of U.S. adults bought prepaid cards in the year preceding the June survey, down from 63 percent in 2016. The wait is over. 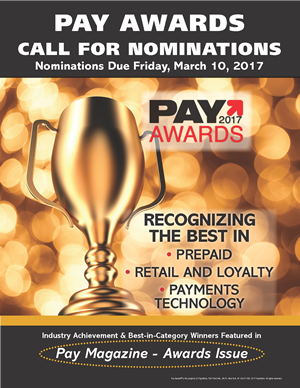 The 2017 Pay Magazine - Awards Issue is here. In this special issue, you’ll find out more about the programs, companies and two individuals that walked away with top honors from this year’s competition.